Western blot analysis of extracts from HeLa cells, transfected with 100 nM SignalSilence® Control siRNA (Unconjugated) #6568 (-), SignalSilence® Beclin-1 siRNA I (+) or SignalSilence® Beclin-1 siRNA II #6246 (+), using Beclin-1 (D40C5) XP® Rabbit mAb #3495 (upper) or α-Tubulin (11H10) Rabbit mAb #2125 (lower). The Beclin-1 (D40C5) XP® Rabbit mAb confirms silencing of Beclin-1 expression, while the α-Tubulin (11H10) Rabbit mAb is used to control for loading and specificity of Beclin-1 siRNA. CST recommends transfection with 100 nM Beclin-1 siRNA I 48 to 72 hours prior to cell lysis. For transfection procedure, follow protocol provided by the transfection reagent manufacturer. Please feel free to contact CST with any questions on use. 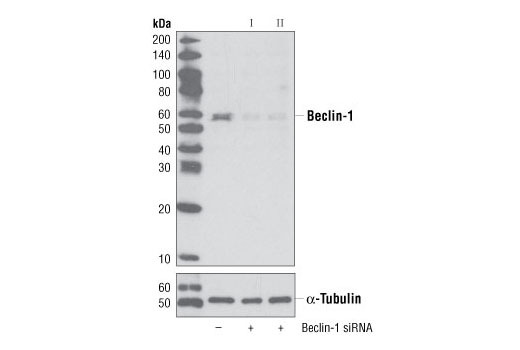 SignalSilence® Beclin-1 siRNA I from Cell Signaling Technology (CST) allows the researcher to specifically inhibit Beclin-1 expression using RNA interference, a method whereby gene expression can be selectively silenced through the delivery of double stranded RNA molecules into the cell. All SignalSilence® siRNA products from CST are rigorously tested in-house and have been shown to reduce target protein expression by western analysis. Autophagy is a catabolic process for the autophagosomic-lysosomal degradation of proteins activated in response to nutrient deprivation and in neurodegenerative conditions (1). One of the proteins critical to this process is Beclin-1, the mammalian orthologue of the yeast autophagy protein Apg6/Vps30 (2). Beclin-1 can complement defects in yeast autophagy caused by loss of Apg6 and can also stimulate autophagy when overexpressed in mammalian cells (3). Mammalian Beclin-1 was originally isolated in a yeast two-hybrid screen for Bcl-2 interacting proteins and has been shown to interact with Bcl-2 and Bcl-xL, but not with Bax or Bak (4). While Beclin-1 is generally ubiquitously expressed, research studies have shown it is monoallelically deleted in 40-75% of sporadic human breast and ovarian cancers (5). Beclin-1 is localized within cytoplasmic structures including the mitochondria, although overexpression of Beclin-1 reveals some nuclear staining and CRM1-dependent nuclear export (6). Investigators have demonstrated that Beclin-1-/- mice die early in embryogenesis and Beclin-1-/+ mice have a high incidence of spontaneous tumors. Stem cells from the null mice demonstrate an altered autophagic response, although responses to apoptosis appeared normal (7). Researchers have also found that overexpression of Beclin-1 in virally infected neurons in vivo resulted in significant protection against Sindbis virus-induced disease and neuronal apoptosis (4). Aita, V.M. et al. (1999) Genomics 59, 59-65. Liang, X.H. et al. (2001) Cancer Res 61, 3443-9. Yue, Z. et al. (2003) Proc Natl Acad Sci USA 100, 15077-82.